This painting of our neighbour shows a man in whose face is reflected the history of much of the twentieth century. I spent hours listening to his fascinating story. Harold was born in Monkstown, County Dublin, in 1921, the same year as the Treaty with Britain that led to the foundation of the modern Irish state. He was sent to school in Windsor, where his classmates included the Romanoff princes, Michael and Andrew, nephews of Tsar Nicholas II. With rumours of war Harold, then 15, became part of the young Officer Training Corps that formed the guard at the funeral of King George V, in 1936. In 1941 Harold joined the Indian Army as an officer. Returning to his native Dublin, his business included making the special red and white striped coatings for Dublin's iconic Poolbeg power station chimneys (featured in my painting 'Shelduck'). Harold is related to the great Irish Fitzgerald family, the knights of Glin, who are descended from the earls of Desmond and the Gaelic kings of Connaught. Years ago I had the pleasure of bringing his grandsons into the Aer Lingus aircraft simulators at Dublin airport, and Jeremy is now an explorer and famous photographer. Harold was also friends with Capt Kelly-Rogers, formerly Winston Churchill's personal pilot, who lived near us in Portmarnock. All of which made for a fascinating historical swirl in which to paint a portrait of this remarkable man. 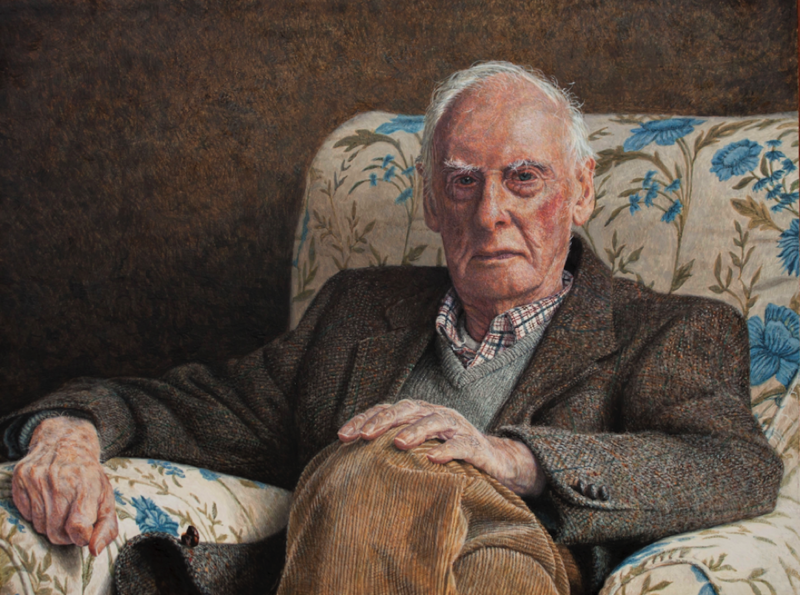 Shortlisted for the National Gallery of Ireland's Hennessy Portrait Prize 2016.